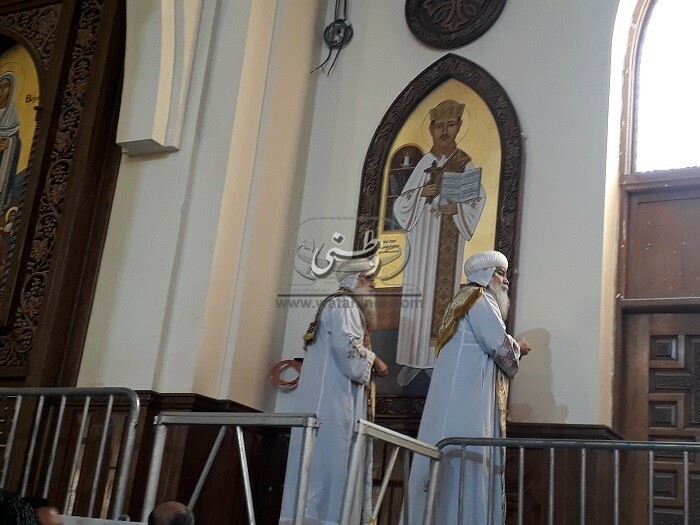 This year, 2018, marks the golden jubilee of St Mark’s Cathedral in Abbassiya, Cairo, seat of the Coptic Orthodox Patriarch of the See of St Mark. The Cathedral was opened on 25 June 1968 and the first Mass was held there on 26 June 1968 by Pope Kyrillos VI who was patriarch during 1959 – 1971, and who was canonised by the Church in 2013. To honour the occasion, the Cathedral underwent a much-needed renovation process that took four years to complete and endowed it with bright magnificence. 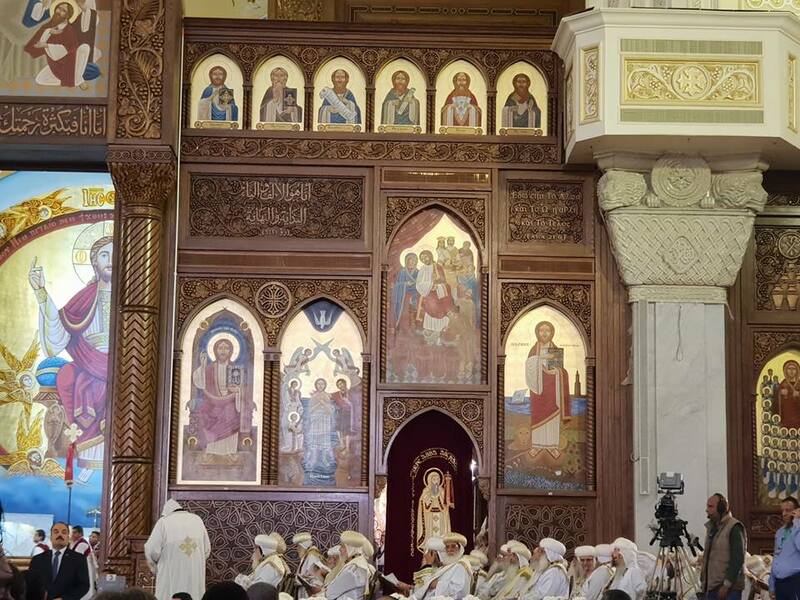 Sunday, 18 November, saw Pope Tawadros II preside over the consecration ceremony of the fully renovated Cathedral. 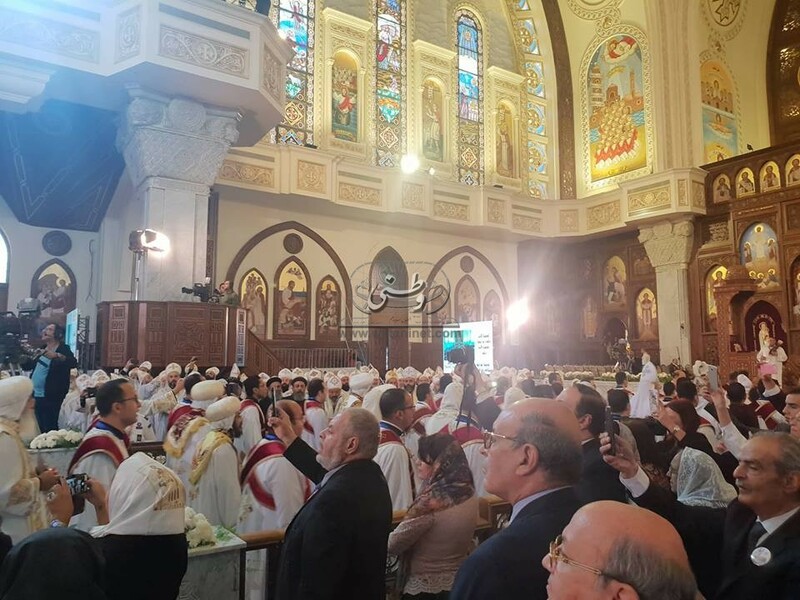 Participating with the Pope in the Cathedral consecration were members of the Coptic Orthodox Holy Synod of Bishops, as well as priests, archdeacons and deacons. It was an auspicious day, for it also marked six years on the enthronement of Pope Tawadros II on 18 November 2012. Early on Sunday morning Pope Tawadros, dressed in white clerical vestments, emerged out of the papal residence which lies across the road from the Cathedral, inside the Cathedral grounds. The bells broke into joyful chimes as he headed to the Cathedral. He stopped at the entrance to unveil a commemorative marble plaque, and take a souvenir photograph with the bishops who stood in their clerical vestments waiting to enter the Cathedral with him, as well as the members of the committee that had supervised the Cathedral renovation. 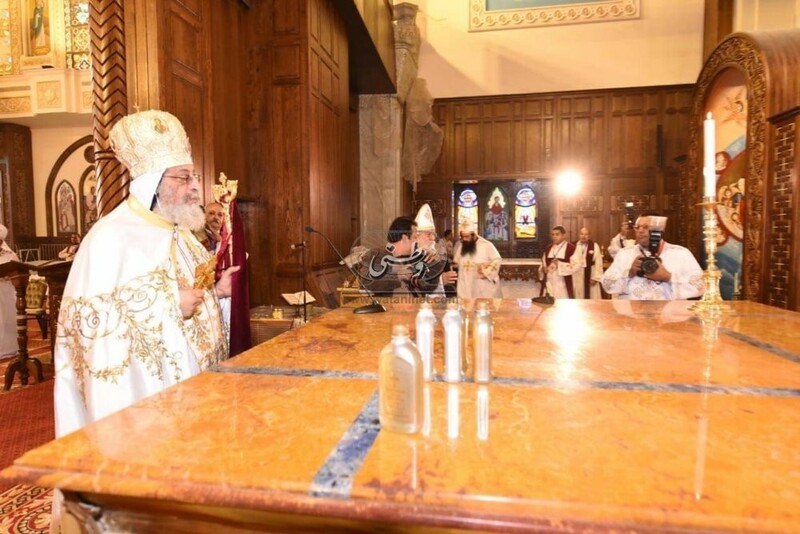 Among the bishops were Bishop of New York Anba David, and Metropolitan of Jerusalem and near East Anba Antonios; they had come especially to participate in the consecration of St Mark’s. A bishop procession formed and, escorted by the deacons, they entered the Cathedral to the Hymn of Hosanna Sunday: ++“Evlogimenos”++ [“Blessed” is he who comes in the name of the Lord], also known as the patriarchal entry hymn, gloriously sung by the Clerical College choir. Decked in roses, St Mark’s was resplendent in its new icons, mosaics, stained glass, arches, and intricate woodwork sculpture that depicted Christian symbols: crosses, wheat sheaves and the fruit of the vine. An eager congregation waited inside, having passed the tight security outside and been escorted to their seats by the members of the Church Scouts. Pope Tawadros began by explaining the consecration ritual. He said that it is tantamount to giving the church a ‘birth certificate’, and is performed once in its lifetime. Following the Prayer of Thanksgiving, the psalms and Bible reading, he said, seven litanies are prayed: the litanies for the sick; the travellers; the departed; the earth, winds, and waters; the head of State; the evangelised; and for the offerings. Then the consecration proper starts, with the congregation taking active part in the prayers. As the prayers begin, the congregation responds with “Amen”; once it concludes, they say “Oh Lord, answer [our prayers]” then, once the Chrism is poured on the altar to sanctify it, and the altar is given the name of its patron saint, they raise a joyful “Hallelujah”. Chrism is the holy oil formed of olive oil and remnants of the sweet spices, used as a perpetual ‘yeast’, that were in the tomb of Jesus. New altar coverings and other holy articles are placed on the holy table and the vigil light is lit. The Pope, joined by 12 bishops, consecrated the central altar in the name of St Mark. 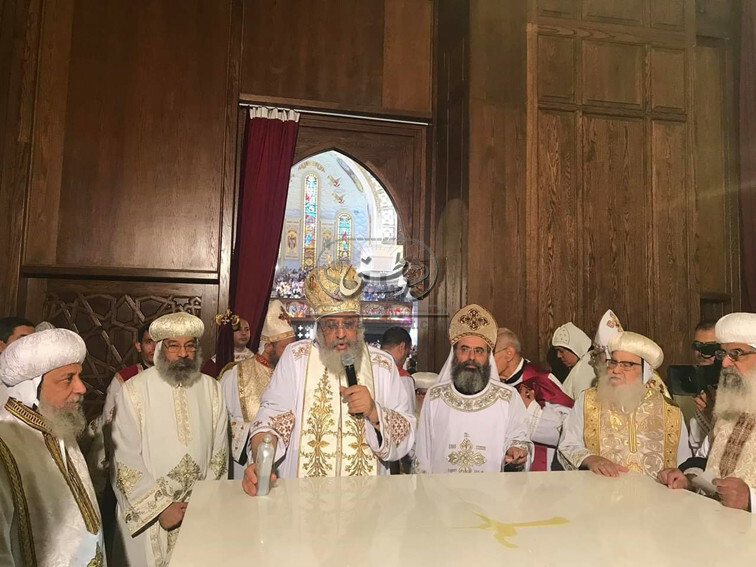 He was joined by nine other bishops to consecrate the north-side altar in the name of the Holy Virgin, and the south-side altar in the name of Pope Athanasius the Apostolic and Pope Kyrillos VI. He then anointed the icon in ‘the Bosom of the Father’, the niche in front of the altar. As traditional, it depicts Christ the ‘Pantocrator’ [Ruler of All] and, stretching across a staggering 600 sq.m, is the largest icon in the Cathedral. 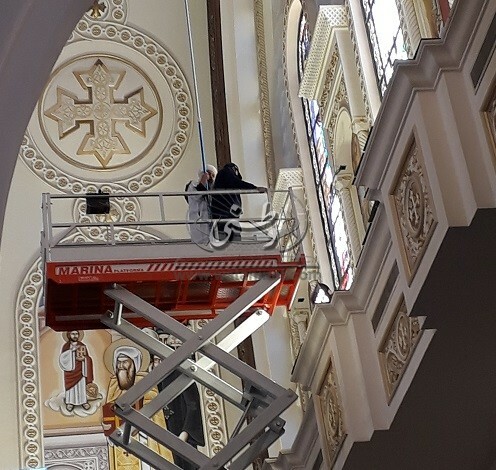 The icons on both sides of the nave were then anointed; a number of metropolitans and bishops had to be carried up on a steel ladder to reach the higher ones. 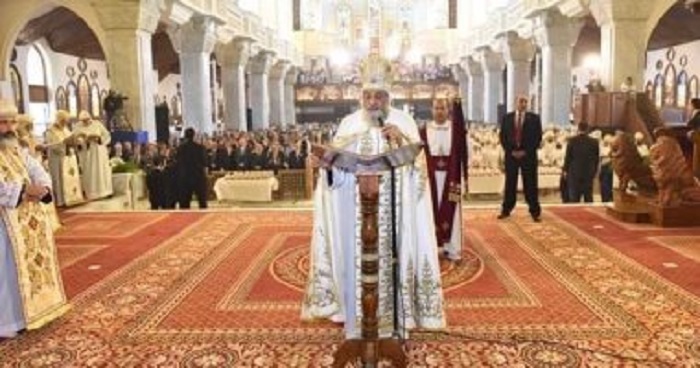 Pope Tawadros focused on three points regarding the Cathedral. First, he said, it has been endowed with such heavenly beauty that is palpably felt by anyone who steps inside. Second, the Pope said, the 200-icon church includes icons of modern-day martyrs and saints some of whom were never iconis ed before. 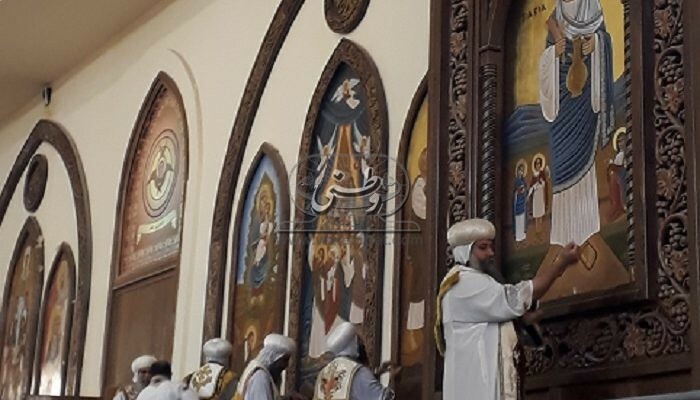 Among these are the 20 Copts beheaded for their faith by Daesh, also known as Islamic State (IS) in Libya at the outset of 2015; also Pope Kyrillos VI and Archdeacon St Habib Girgis who founded Sunday Schools in the Coptic Church 100 years ago. Both were canonised in 2013. 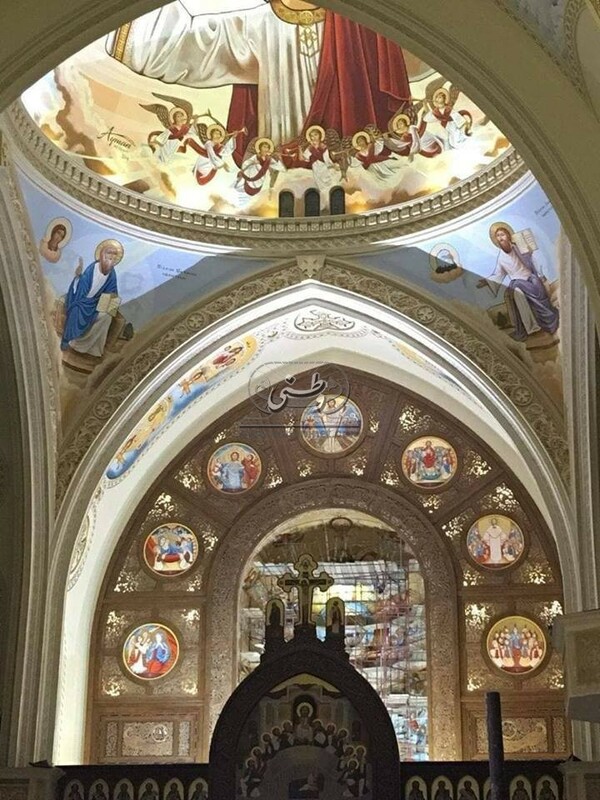 Watani had closely followed St Mark’s Cathedral renovation which was executed under supervision of a special committee formed by Pope Tawadros. The main goal was that the Cathedral, in its capacity as the seat of the Patriarch of the See of St Mark, should uniquely express the Egyptian Church in its rich spirituality and history. The committee was made up of six members from various branches of art in addition to a general coordinator. Members of the committee were Fr Arsanius of Anba Pola Monastery, who is a seasoned iconologist; architects Mounir Abdu Fam and Samy Sabry, both experts in Coptic art and architecture; Tassoni (literal for ‘Sister’ in Coptic) Sawsan, herself an iconographer; as well as Samuel Matthias as administrative coordinator and Joseph Abdel-Massih as representative of Orascom Construction (OC), the company handling the construction and technical aspects inside the Cathedral. Dr Matthias said that the opening had been scheduled for May 2018, to precede the anniversary of the original opening date in June 1968 but, owing to technical problems that came up during the renovation process, it was impossible to meet the deadline. So the later date 18 November 2018 was scheduled for the opening, to also celebrate six years on Pope Tawadros as Patriarch. 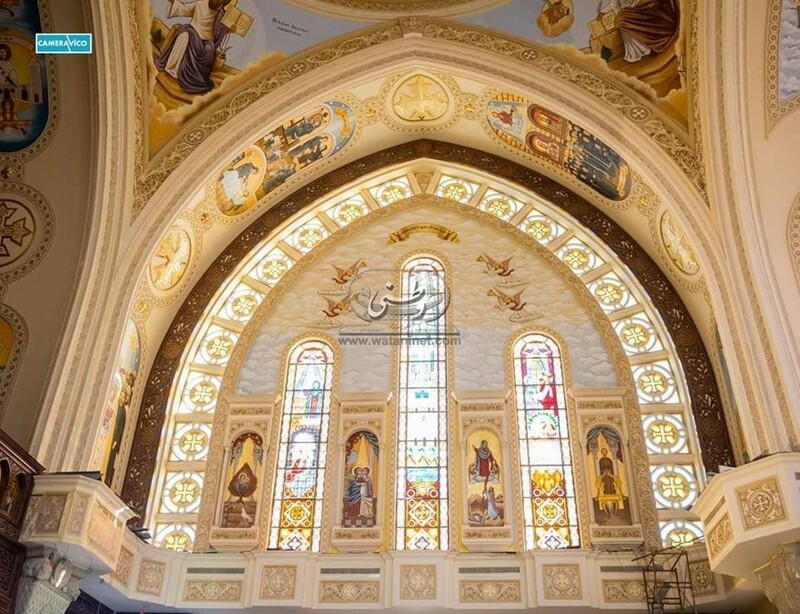 According to Mr Fam, the renovation work included expanding the deacon choir space to 100 metres long, according to a request by Pope Tawadros, so as to accommodate the large number of bishops, priests and deacons. The Holy Synod includes 120 bishops. The Cathedral has been equipped with large fixed-screens for display, as well as monitors and TV-outputs. Tassoni Sawsan explained that the renovation included new icons and mosaics to cover the walls of the church. A competition was announced early in 2015 among iconographers for the writing of the new icons at St Mark’s. The main condition was that the artists should adhere to the Coptic style of art. Two months later, the winners were announced and, directly, the work began. [http://en.wataninet.com/coptic-affairs-coptic-affairs/coptic-affairs/new-icons-for-st-marks/15435/]. 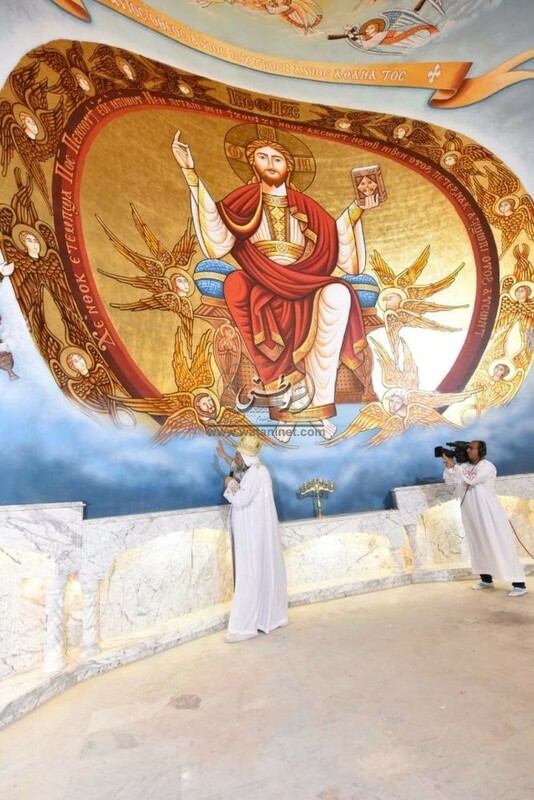 Pope Tawadros had insisted on including young artists in painting the Cathedral icons. The winners constituted six groups, each individual group formed of several members working as a team to prepare and execute the icons designed and planned by their leader, the main iconographer. Each group was assigned with writing the icons for a specific site in the Cathedral. The execution phase included three steps: the first was ‘enlarging’ the design; the second was the colouring which should conform to standard colours; and the third phase constituted hanging the designs on the walls. “The plan was to divide the iconography work according to the various spots in the Cathedral,” Tassoni Sawsan explained. 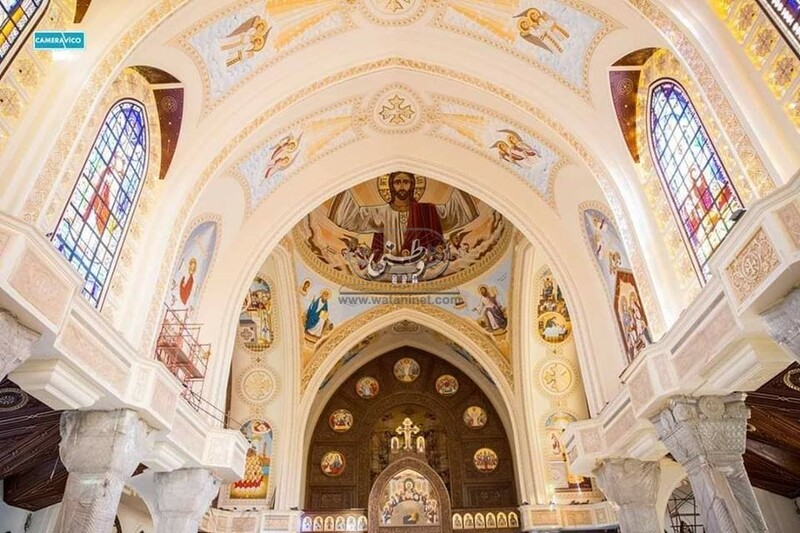 Coptic churches are designed so that the sanctuary lies to the east—interestingly, the tradition goes back to ancient Egyptian temples—and the church entrance thus lies to the west. “The artists were all committed to a unified palette, so that the paintings would finally appear as though executed by a single artist,” she explained. The mosaic on the western façade which holds the doors to the Cathedral, Mr Helmy said, features a sun in the centre, symbolising Jesus Christ the ‘Sun of Righteousness rising with healing in her wings’ Mal 4: 2, shining His light over all the world. On top stands a large-size Coptic gilded cross. Right and left, angels hold olive branches symbolising peace and love, according to the teachings of the Bible: “On earth peace to those on whom His favour rests”. State-of-the-art methods of insulation were used during construction, Saad Makram, professor of architecture at Mansoura University, said. It was important, he said, to avoid erosion and the wear out of wall paint and other surface materials. “One of the most important reasons that maintained harmony all throughout the work process was that everyone involved put in dedicated effort, viewing the work as a mission. Most were Church servants, volunteer workers in the Church, so there was common understanding among them. Until the 1960s, the Coptic Orthodox papal seat was at the Cathedral of St Mark’s in Azbakiya in central Cairo, which had been built in 1800. 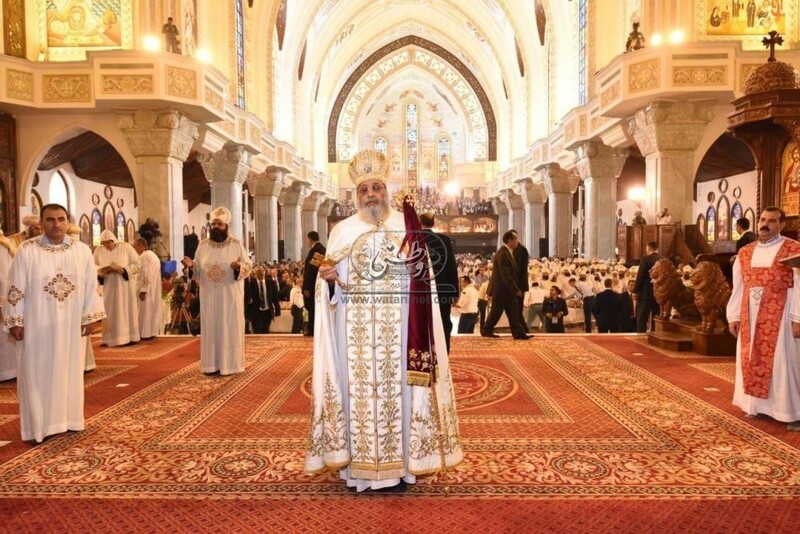 Pope Kyrillos VI decided that the Coptic Orthodox Church needed a new, more spacious, more modern cathedral. The land was available; the Church owned a vast plot in Abbassiya, known as Anba Rweiss land. 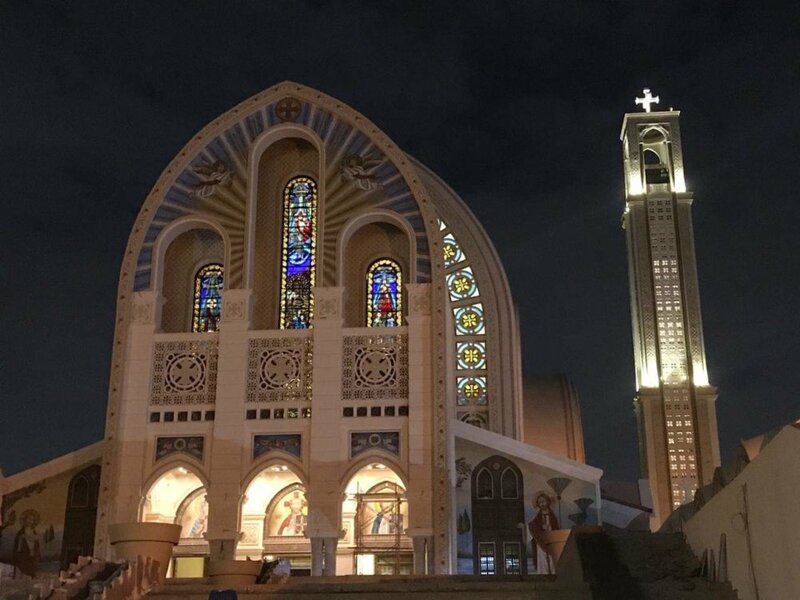 The Coptic architects Awad Kamel and Selim Kamel Fahmy made the design for the new cathedral, and the foundation stone was laid on 24 July 1965 by Pope Kyrillos VI and President Gamal Abdel-Nasser. The building was executed by the contracting firm SPICO (Nile Construction Company), supervised by the architectural firm owned by the well-known Michel Bakhoum. The Cathedral was opened in a grand ceremony on 25 June 1968, marking 19 centuries since St Mark was martyred in Alexandria. Participating were Egyptian President Abdel-Nasser, Ethiopian Emperor Haile Selassie, and heads of Churches from all over the world. The first Mass was held at St Mark’s the following day, 26 June 1968. The relics of St Mark, which had remained in Venice since 828 and were brought to Egypt from Rome on 24 June 1968, were placed in a shrine under the new Cathedral.